The view from almost anywhere along the Grand Canyon South Rim is spectacular; a kaleidoscope of colors, ever changing, never the same. Almost five million people a year visit the Grand Canyon National Park, which, in 2011, made it the second most visited national park in the United States. Surprisingly to me, it received less than half the number of visitors as that of the Great Smoky Mountains National Park in South Carolina and Tennessee which received the most visits. In January 1908, President Theodore Roosevelt exercised his right to make more than 800,000 acres of the Grand Canyon area into a national monument. "Let this great wonder of nature remain as it now is," he declared. "You cannot improve on it. But what you can do is keep it for your children, your children’s children, and all who come after you, as the one great sight which every American should see." Books and Maps about Grand Canyon South may be purchased at the Visitor Center, or you may purchase them through Amazon.com by clicking the link below. 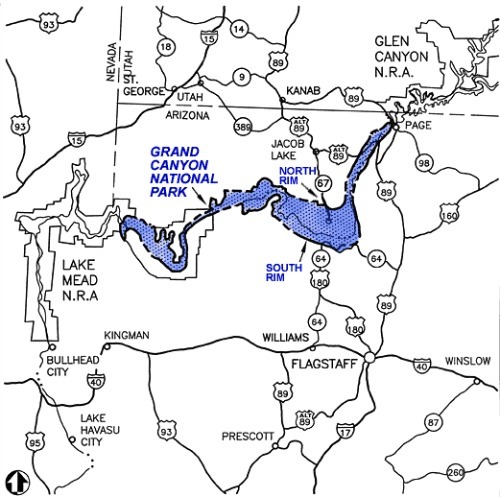 The Grand Canyon starts at Lee’s Ferry, approximately 88 river miles northeast of Phantom Ranch and ends approximately 189 miles west near Lake Mead. 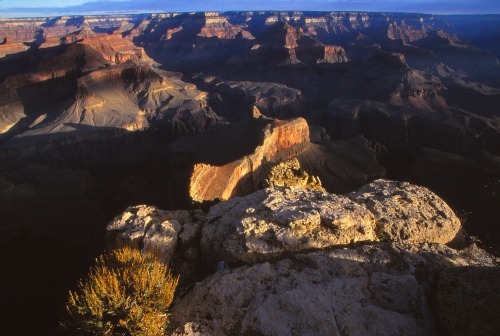 The Grand Canyon National Park is composed of two parts, the North Rim and the South Rim. A chasm, as wide as 18 miles, separates the two. At the bottom of this one mile deep chasm is the Colorado River. Although the Grand Canyon North Rim is only 10 miles, as the crow flies, and 21 miles by foot from the South Rim, it receives only a fraction of the five million annual visitors received by the more accessible South Rim. • 80 miles northwest of Flagstaff (via route 180). The Grand Canyon South Rim is open 24 hours a day, 365 days a year. All visitor services: camping, lodging, and restaurants are available year round. Reservations are strongly recommended during spring, summer and fall. Some facilities close during the winter. and includes both the North Rim and South Rim. All National Parks & Federal Recreational Lands Passes are accepted. For a unique and fun way to travel to the Grand Canyon South Rim, you might want to consider the Grand Canyon Railway. Grand Canyon Railway made its first journey to the South Rim in 1901, long before there were paved roads, and even before the canyon was made a national park. Passenger service to Grand Canyon National Park stopped in 1968 as train travel gave way to the popularity of automobile travel. Grand Canyon Railway service began again in 1989 and has been going strong ever since. Today, the Railway carries over 200,000 people to the canyon each year. In addition to train travel to and from the Grand Canyon South Rim, the Railway offers several vacation packages, stays at Williams and Grand Canyon hotels and RV parks and much more. Grand Canyon National Park's free shuttle buses operate in and around the Grand Canyon South Rim Village. • The routes interconnect, but do not overlap. • No tickets are required, and bus stops are clearly marked throughout the park by signs. • Buses are white with a green stripe. • The buses display the route name on the front. • Pets are not permitted on buses. • Each shuttle bus is equipped with a 2 or 3-capacity bicycle rack on the front. • Service may be suspended during inclement weather. A variety of lodging facilities are available. Lodging is booked well in advance, especially during the summer months. Be sure to make reservations as far ahead as possible. To check on availability and prices, use the Search Box above. Simply enter the dates you have in mind, and the server, Hotels Combined, will provide you with a list of the lodging available on the dates you have specified. The nearest towns of any size are Flagstaff and Williams, Arizona. To check on lodging in either of these two towns, use the search box on the right. You will need to enter the name of the town as well as the dates you desire. • Offers tent and RV camping. • Accessible campsites and restrooms are available. • Pets are allowed, but must be leashed at all times, and may not be left unattended. • Wood and charcoal fires permitted in provided campsite grills only. • No gathering of down wood, wood may be purchased at the general store. • Laundry and showers located near the campground for a fee. $50/night. Maximum of 50 people and 3 vehicles per group site. • Reservations are strongly recommended from March 1 through mid-November. Mather Campground is usually full by noon during the busy season. • Pets are NOT ALLOWED below the canyon rim at any time. Pets are NOT permitted on the shuttle buses. Kennels are available in the Grand Canyon South Rim Village. 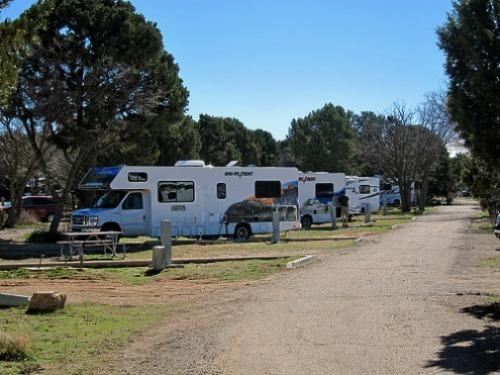 For those visitors with RVs who require hook-ups, Trailer Village, located adjacent to Mather Campground, accommodates Recreational Vehicles up to 50 feet in length. Trailer Village is operated by Xanterra Parks & Resorts® and is open year-round. A dump station (closed during the winter months) is located near Mather Campground. Pets are allowed, but must be leashed at all times, and may not be left unattended. For same-day reservations, call (928) 638-2631. Located 26 miles/ 42 km east of Grand Canyon Village. • $12.00 per site, per night. Campsites are on a first come - first served - self-registration basis. The campground is usually full by early afternoon during summer months. 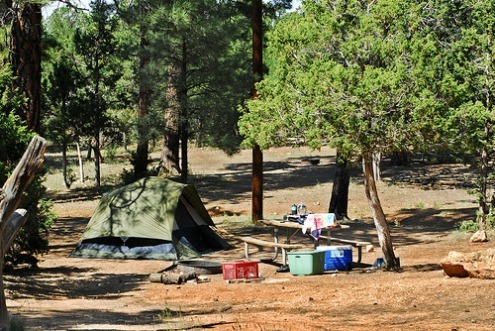 No reservations are accepted for campsites at Desert View Campground. There is a 7-day camping limit. Check out is at 11:00 AM. PETS are allowed, but must be leashed at all times. • Rim Trail - easy hike - offers excellent walking and quiet views of the inner canyon. • Bright Angel Trail – Steep - begins just west of Bright Angel Lodge and offers day hikes of up to 12 miles (round trip). • South Kaibab Trail – Steep - begins south of Yaki Point. Offers day hikes up to 6 miles (round trip). • Hermit Trail – Steep - Unmaintained - offers hikes to Santa Maria Spring, 5 miles (round trip), and Dripping Springs, 7 miles (round trip). • Grandview Trail - Very Steep - offers hikes to Coconino Saddle, 2.2 miles (round trip), and Horseshoe Mesa, 6.4 miles (round trip). Over 250 people are rescued from the canyon each year. DO NOT attempt to hike from the rim to the river and back in one day, especially during the months of May to September. Everyone needs to carry water! Even if you will be hiking on the rim, you still need to carry water. • Plan your hike before you start. • Balance your food and water intake. Eat salty snacks and drink water or sports drinks. • Go slowly, rest often, stay cool. Allow the weakest hiker to set the pace. • During the summer, hike during the cooler, shadier times of the day. Visitors from all over the world come to Grand Canyon National Park to experience the solitude, quiet and natural beauty of backcountry hiking. People of all ages, including small children, senior citizens, and people with physical disabilities have successfully hiked the canyon. The key to hiking the Grand Canyon is preparation, knowing and respecting your limitations and a proper mental attitude. Make your day hikes more interesting by learning about the flora and geology of the area. The ride passes through a Ponderosa Forest and a Piñon and Juniper woodland. 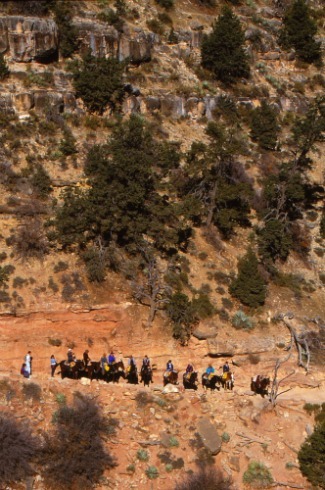 Riders dismount and walk a short distance to the Abyss, an overlook on the rim of the canyon. • $122.81 including tax, per person. (Includes a light snack, and water). • Ride to the bottom of the Canyon. • Spend the night at the Phantom Ranch. • Prices start at $506.82 for one person or two people for $895.11 including taxes. • Prices include accommodations and meals. • This service must be reserved and purchased in advance. • 3 hour Abyss Overlook riders must not weigh more than 225 lbs/102 kg fully dressed. • Must be at least 4 feet 7 inches/140 cm in height. • Must be able to speak and understand fluent English. • Must be in good physical condition. • One-hour and two-hour trail rides through the Kaibab National Forest. • Twilight campfire and wagon rides are available. • Both horses and mules are utilized. • These rides are outside the Grand Canyon National Park near the South Entrance. For reservations and further information, contact Apache Stables at (928) 638-2891. This map portrays the portion of the park where 77% of backcountry use occurs. It is provided solely to indicate use area boundaries and designated campsites. 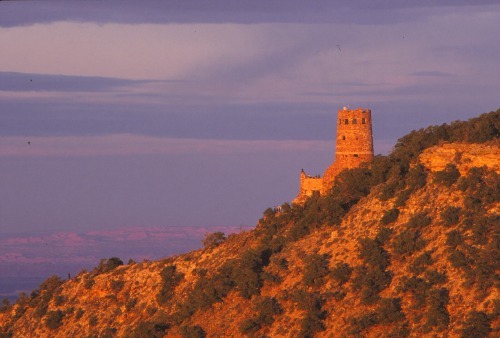 The Watchtower stands like a sentinel at the eastern end of the Grand Canyon South Rim. It was designed by architect Mary Elizabeth Jane Colter, an employee of the Fred Harvey Company, and was completed in 1932. Ms Colter also created and designed many other buildings in the Grand Canyon vicinity including Hermit's Rest, Hopi House, the Bright Angel Lodge, the Phantom Ranch buildings at the bottom of the canyon and the Lookout Studio. Ms. Colter’s vision and inspiration came, in part, from visits to several ancestral Puebloan ruins, such as Chaco Canyon, Hovenweep and Mesa Verde. To read more about the Desert View Watchtower and watch a four minute NPS video, go to http://www.nps.gov/.